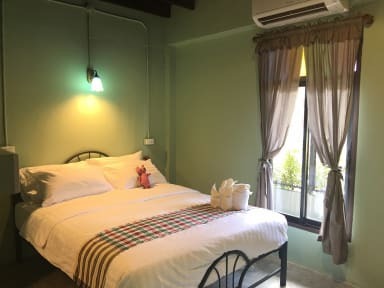 If you are looking for a nice place to stay in Krabi, or searching for a nice boutique hostel, there are so many choices that it may be hard for you to decide among them. If your focus is not those big chain hotels near the beach, but smaller, charming, boutique, awesome or “Earth Friendly” hotels that offer unique decor and services, as well as a good value, Talardkao Balcony is an option you would better consider. If you are big traveler or hipster who loves to seek new experiences, learn new culture,disturbed not by many tourists and party things, interested not on watching TV and smoking, and addicted not to the luxury and conveniences like most typical hotel comfort being offered, then we are the right place that suit you and, probably, you are a guest who fits us. A very nice and cozy place absolutely recommended any day if you are in Krabi, stayed for a night had to catch a flight next day. I stayed at this hostel to be close to the airport for an early morning flight. It does not have many food or activity options around it, but is a great place to stay if you want to be near the airport. Staff was friendly and the rooms were nice. Amazing Hostel, I had my passport mailed to the hostel and they held onto it for 2 days while I was in Phi Phi. Super friendly staff, not the best location but if you want to be close to the bus terminal its great. I would recommend this place to anyone going to Krabi! This hostel is lovely!! The owner was very sweet, gave us water on arrival and actually took us to the airport the next morning! A great hostel to stay over night if your flying out of krabi as the hostel is no more then 15 minute away. If you’re looking to be close to attractions or the pier to go to islands, this place is quite out of the way. But if you want to get away from the tourists, this is a great spot! It’s very cute and quaint and the owner was the absolute sweetest! Stayed here before heading to the airport and the owner drove us for a good price. Would recommend! 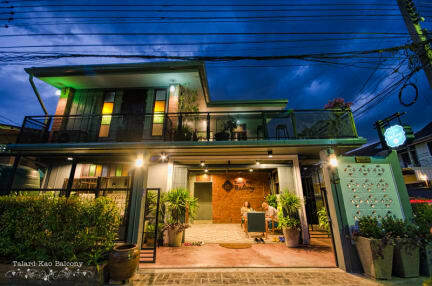 Boutique hostel in a beautiful area. A lot of people go there because it’s close to the airport but it’s probably cheaper to get a shared ride from town. Great place for a quiet getaway. Nice little hostel, if you need one-night place near airport or bus station this is perfect stay. Otherwise really far aways from city center, almost 1 hour walk.